Needle phobia is very common in people that suffer with anxiety. 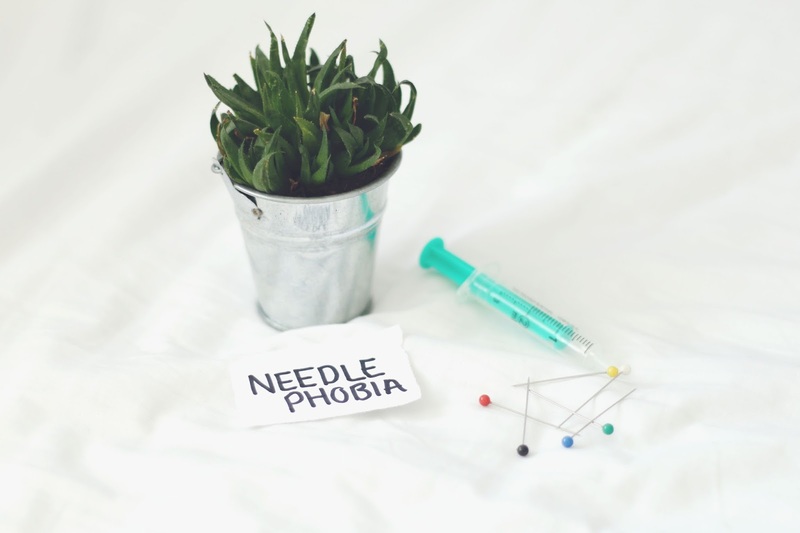 The correct name for ‘needle phobia’ is actually Trypanophobia. Apparently 20% of people suffer from this phobia, so don’t feel alone if you do suffer with it. I don’t recall suffering from needle phobia when I was a child, sure I hated having vaccinations but they were a rare occurrence and not something I would worry about much. It was when I reached Year 8 in school, it was time for the HPV vaccines. These set of three vaccines (now reduced down to two) prevent against cervical cancer, so of course they’re very important. This was the first time I’d be faced with injections since I was about 5 years old, so obviously I was very nervous. I was also horrified that I had to have three of them across the space of a few months. When faced with the first injection I refused to go into the gym hall, where they were holding the vaccinations. I cried and I screamed and I did not want to go into that room full of people having injections. The school nurse ended up forcing me into the room, and threatening me saying I’d have to sit down breathing in and out of a paper bag if I didn’t calm down. This was because I was having a panic attack and hyperventilating so much that I could have potentially passed out. This is when I knew the phobia of needles was real. Even though each time the injects came around, I had them done and obviously they didn’t hurt and weren’t half as bad as I’d pictured in my head but this is not what needle phobia is about. Since then I have had to have two more vaccinations about two years ago. I had these done at the doctors surgery which was much better for me as I was on my own, however the first time around I had another panic attack and could not have them done. Second time round I managed to calm myself down enough to not panic what so ever and have them done, that was the bravest I’ve ever been. Anyway enough about my experiences and onto what having needle phobia consists of. I personally hate the sight of needles, the thought of needles, basically anything related to them. If they appear on a TV programme or movie I will turn away so quickly its unreal. Its not the needle itself or the pain, its the thought of the needle inserting into my skin. I think thats the key thing from this, its the thought, the ‘what ifs’ the sharpness of the needle. I’ve had so many people say ‘having a blood test/injection doesn’t hurt you know’ and I do know. I’m not afraid of the pain, I’m afraid of the needle going into my skin. So many people make comments like this and I know they don’t mean to be rude or inconsiderate but its not helpful and I know they don’t understand my fear. I’ve tried CBT therapy and another type of therapy where I start with looking at pictures of needles then work my way up to holding an actual surgical needle. As far as I was concerned this worked, but as soon as I booked in to have a blood test (I hadn’t been feeling well and was told I needed a blood test) I couldn’t do it. I tried 5 times to have that blood test but failed each time, and I still haven’t had it done because I’m just unable to cope when it comes to needles. Needle phobia doesn’t effect me like my emetophobia does however its still a serious problem and a pretty horrible phobia as having any surgical treatment is a right old chore and tiresome. Because of my needle phobia, going to the doctors, dentist and hospitals mostly can cause me trauma as I put two and two together. I fear hospitals and illness tremendously because I’m terrified I’ll end up with a needle in my arm. So its not just the needle itself I suppose but the surrounding factors. Theres help available for this phobia, online and in person therapy. I’m yet to find what will work for me and how I’ll get over this phobia, but hopefully I will do sooner or later. This webpage is really useful and helpful if you’re suffering from needle phobia, it says a bit about what it is and some help available. Again if you suffer with this phobia I am happy to talk about it if you DM on twitter or email me! Do you suffer/know anyone who suffers from needle phobia?